Nikon has finally announced the arrival of the D3S – the company's professional snapper which moonlights as a video camera. Toting a 12.1MP FX CMOS sensor, the D3S is modelled round Nikon's D3 chassis, but packs in some brilliant new features. Nikon has been extremely busy in the last few years, quickly redefining professional cameras for the marketplace. The company has built up a desirable pro range: from the D3 and the D300, to the prosumer D700, to its last efforts the D300S and D3X. Although the latest addition, the D3S, doesn't have anywhere near the pixel power of the D3X (which boasted 24.5MP) the camera certainly packs a punch when it comes to low-light shooting. This is all because of the camera's stunning ISO range. The D3s offers an ISO of 200-12,800. This has been achieved with a lot of jiggery pokery on Nikon's part, where they have completely re-designed the sensor. This latest ISO range is definitely redefining the boundaries as it means that you will be able to shoot handheld footage at night with the camera. Other new features include: an optional 1.2 Crop mode; a re-jigged AF Fine Tune menu (there's now six options); the AF system's auto area has been improved which ups the quality when shooting 9fps; and there's also been a buffer increase. Another great addition is the ability to edit RAW images in-camera. For the first time you can tweak colour levels and the like and export to JPEG all within the camera. The biggest draw, however, will be the D3S' ability to shoot HD video. Nikon is no stranger to adding video to its DSLRs - in fact it was the first company to do this with the launch of video on the D90. Interestingly, Nikon has chosen not to go with Full HD but has settled on 720p 24fps shooting for its D-Movie mode. This can be done in up to five minute bursts, which will take up around 2GB of memory. The Nikon D3S has a UK release date of December, and will cost £4,199.99. For more details, go to www.nikon.co.uk. 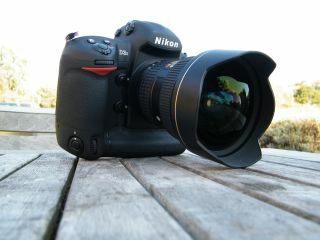 If you want to read more about the Nikon D3S, then click on TechRadar's in-depth hands-on with the camera.